It’s that time of the year when UK retailers try to outdo each other with the most original Christmas TV ads. In 2016, John Lewis came out with arguably the best Christmas TVC in a long time, if not ever. That ad cost about £1 million to produce and they spent another £6 million on air time. During the six week period to December 31 that includes Christmas, gross sales at John Lewis were up 4.9% to £998.1 million. Online sales accounted for 40% of sales, which grew 11.8% compared to bricks-and-mortar shop sales that managed a meagre 0.8%. The Marks & Spencer 2017 Christmas advert is the first to be aired this year and they will be looking to see similar numbers come December 31st 2017. It’s a very topical ad as it’s linked to the release of Paddington 2. This ad moves away from the traditional emotional roller coaster to a more feel good theme wrapped around Paddington Bear and ‘Father Christmas.’ Don’t worry no plot spoilers here! Needless to say Paddington and ‘Santa’ have a series of adventures across London and encounter more than their fair share of cliches but that’s fine, it’s Christmas. 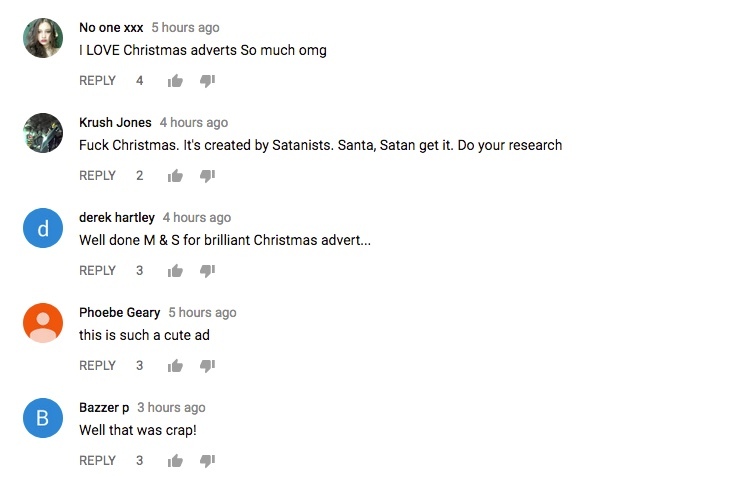 Social media, or certainly those viewing the ad on YouTube have responded with typical British humour! Here’s a selection of comments!